Frontispiece from Joseph Glanvill, Saducismus Triumphatus: Or, Full and Plain Evidence Concerning Witches and Apparitions (London, 1682). Image courtesy of the Schoenberg Center for Electronic Text & Image, University of Pennsylvania, Philadelphia. The Omohundro Institute recently reissued “‘Pale Blewish Lights’ and a Dead Man’s Groan: Tales of the Supernatural from Eighteenth-Century Plymouth, Massachusetts,” on their mobile app, the OI Reader. Originally published the William and Mary Quarterly in 1998, this essay has always been one of my favorites. “Pale Blewish Lights” examines a richly detailed haunting incident. In 1733, tenants renting the Thompson Phillips mansion in Plymouth, Massachusetts, complained of strange lights and unusual noises, which they attributed to the specter of the recently deceased mariner. Phillips’s father-in-law, a civil magistrate and Indian missionary named Josiah Cotton, responded to the rumors by filing a slander suit against the loose-lipped tenants. 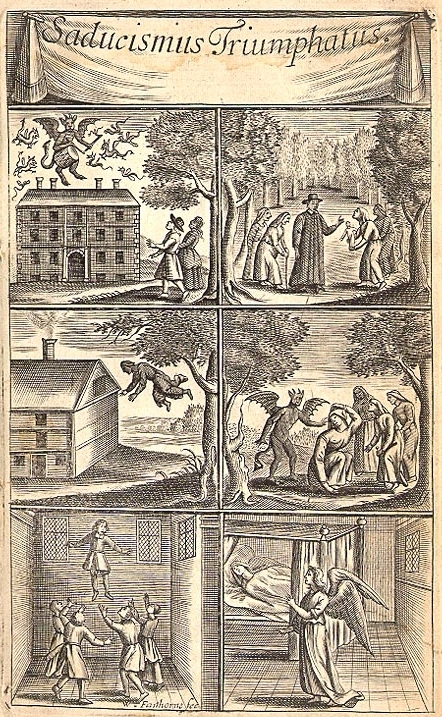 The rich documentary record of the resulting lawsuits, which include trial depositions, Cotton’s memoirs and diary, and his unfinished essay, “Some Observations Concerning Witches, Spirits, & Apparitions,” provide a unparalleled opportunity to examine competing supernatural beliefs in eighteenth-century New England. To access the article, install the free OI Reader from the App Store or Google Play and download the “Bancroft Prize 2018” file. In addition to “Pale Blewish Lights,” the download package also includes links to Part 3 of Darkness Falls on the Land of Light; my recent interview with Liz Covart, host of the Ben Franklin’s World podcast; and “Souls Filled with Ravishing Transport: Heavenly Visions and the Radical Awakening in New England,” which appeared in the William and Mary Quarterly in 2004. Many thanks to Nadine Zimmerli, Kim Foley, and the rest of the OI team for creating this exciting digital platform for my research. Earlier today, Columbia University announced that Darkness Falls on the Land of Light has been awarded one of three Bancroft Prizes for 2018, along with Waldo Heinrichs and Marc Gallicchio's Implacable Foes and Louis S. Warren's God's Red Son. DFLL is the first Bancroft Prize winner published by the Omohundro Institute since 2003 (James F. Brooks, Captives and Cousins) and the third written by a current or former faculty member at the University of Richmond (Edward L. Ayers, In the Presence of Mine Enemies; Woody Holton, Abigail Adams). Only a handful of books on American religious history have received this distinguished award since its inception in 1948. Among them are several important studies that have played a formative role in my intellectual development, including Richard L. Bushman's From Puritan to Yankee, John L. Brooke's The Refiner's Fire, Christine Leigh Heyrman's Southern Cross, and George Marsden's Jonathan Edwards. It’s humbling to think that my scholarship now stands alongside these and other works by the titans of early American history, from Henry Nash Smith and Edmund S. Morgan to Robert A. Gross, Laurel Thatcher Ulrich, and Alan Taylor. I’d like to express my deepest thanks to Fredrika Teute, Paul Mapp, Nadine Zimmerli, and Kaylan Stevenson at the Omohundro Institute for bringing DFLL to life; to Chuck Grench and the University of North Carolina Press for co-publishing and promoting the book; and, especially, to the Columbia University Libraries and the Bancroft Prize selection committee for this amazing honor!